Roamin’ Rich has been a strong advocate and publicist for any and all things about the community of Route 66 and other old US highways. His mission is to appeal to as many people he can all over the world. He wants to expose the world to the iconic landmarks, people, buildings, historic infrastructure, and the diverse culture that reside along the all old US highways all across this great country. Rich’s works have been recognized or utilized by major entities such as Phillips 66, the Smithsonian Channel, Sports Illustrated, many notable authors, and periodicals revolving around the Route 66 community. Rich has published articles highlighting people and places of Route 66 in multiple Route 66 magazines. He is currently working to produce his first book consisting of rare images of lesser known sections of Route 66. Some of Rich’s photography has been featured by Steve Clem in an exhibit at the Sand Springs Cultural and Historical Museum. Other sources have utilized Rich’s photography or videos for promotion or advertising. Roamin’ Rich has sponsored the creation of several Route 66 websites offering to serve tourists, explorers, and the community with a heightened, gratifying experience. Many of Roamin’ Rich’s works have been highlighted throughout local newspapers, TV news reports, written articles, books, and YouTube videos. 2010: In an attempt to help guide fellow explorers and to welcome curious tourists, Roamin’ Rich started painting Route 66 shields on the road itself in all eight states Route 66 crosses. Rich made the same stencils available to local public works, road commissions, and road chambers of commerce so they might be able to attract more tourism to their community. People from all over the world adore the Route 66 shield painted on the pavement. They lie next to it, pose on it, and park their cars and motorcyles next to it in an attempt to immortalize the memory perfectly in a photograph or video. The painted shields also help to guide tourists that may become lost or turned around. Local entities using Roamin’ Rich Shields are as follows: Oldham County, Texas. Cuba, Missouri. Tucumcari, New Mexico. Roamin’ Rich also provided the shields and the stencils in use at the MidPoint of Route 66 in Adrian, Texas. Also in 2010, Rich created the Route 66 Adventure Truck. The 1994 Chevy Blazer was a purchase inspired by a video Rich watched called, Bones of the old road, featuring Jerry Mclanahan and Jim Ross. The adventure truck has been an indispensable asset making Roamin’ Rich’s missions achievable. The truck was a modest purchase. It was pulled from a grassy field in Sullivan, Missouri – Not too far from Route 66. Rich has invested many hours making the truck into a worthy off-road exploration vehicle over the year. A conception of Roadie Hood happened at the same time as the Adventure Truck. Bob Waldmire was the chief inspiration for the concept. Roamin’ Rich regretted not meeting the hippie road icon. Because of this, Rich set out to meet as many people and capture a small piece of them on the hood. The original hood from the 1994 Blazer was painted black and features a large Route 66 shield in the middle. Rich set out to acquire autographs and signatures from notable icons, roadies, and people that represent the small Route 66 communities across all eight states. Since 2010 people have been signing the hood, immortalizing their contribution to Route 66. The Roadie Hood is now in storage to prevent damage. Since the creation of the hood, there have been multiple icons that have passed away. Gary Turner, Annabelle Russell, Bill Shea, and Ernie Edwards are all contributors to the Roadie Hood that have passed on. Getting an autograph on the hood is a serious honor these days. Please be respectful with inquiries. To date, Rich has not signed the hood. 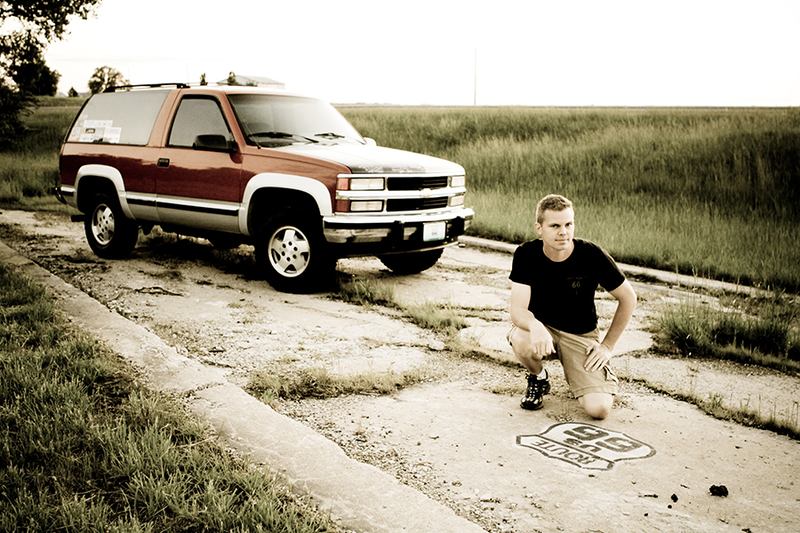 Rich’s original calling was to find unknown abandoned sections of Route 66. To date, Rich has brought to light or helped rediscover multiple historic sections of Route 66. Other discoveries have been in the form of culverts, low water crossings, bridge fragments, state right of way markers, subterranean layers, or paths baring an unpaved surface. These discoveries are located in all eight states Illinois, Missouri, Kansas, Oklahoma, Texas, New Mexico, Arizona, and California.